The USDA Forest Service Urban Natural Resources Institute (UNRI), in partnership with the University of Massachusetts, the Massachusetts Department of Conservation and Recreation (DCR) a n d t h e Town o f Amherst, MA have recently completed a unique public awareness project that involved the development of ‘Tree Benefits Labels” to illustrate the ecosystem services provided by urban trees. 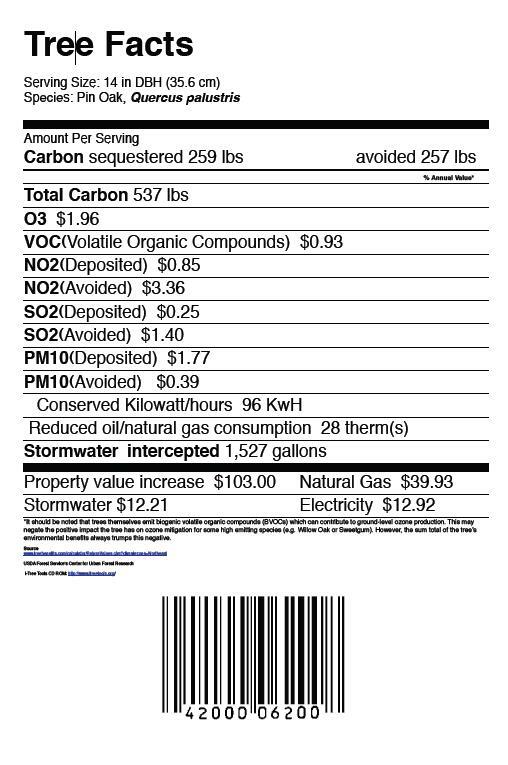 The labels, which are modeled on the food nutrition labels found on grocery products, provide a listing of benefits provided by the trees, in a format that is familiar to many. The Nutrition Labels utilize the scientific calculations developed in the i-Tree Streets software tools, and provide a varied summary of the ecosystem services provided by a tree growing in an urban setting. The idea of the project is to provide the general public with information in a creative and attention getting manner. The inclusion of a ‘bar-coded’ scanning identifier on the label helps to get a person’s attention as they pass by the labels which are hung from tree trunks i n conspicuous public locations. Click Here to download a One-page Brief on a recent use of the Tree Nutrition Labels.